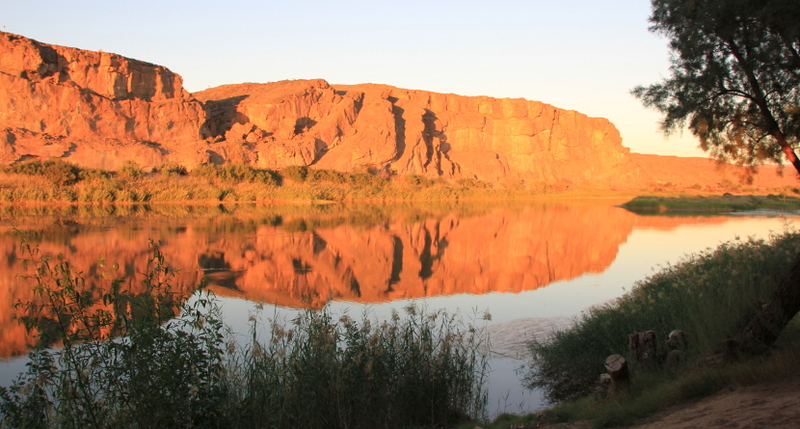 Namibia, May - July 2013 - Orange River, Ai-Ais and Fish River Canyon. 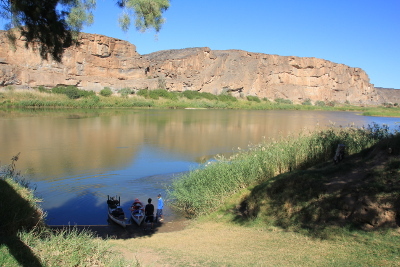 We crossed into Namibia at the Vioolsdrift/Noordoewer border post and then spent a few days beside the Orange River at Amanzi River camp. We hired a canoe one day and did a couple of short trips along the river. Sunrise over the Orange River. Amanzi also organise canoe trips over several days. We saw one couple leave with their guide. There was plenty of bird life beside the river. 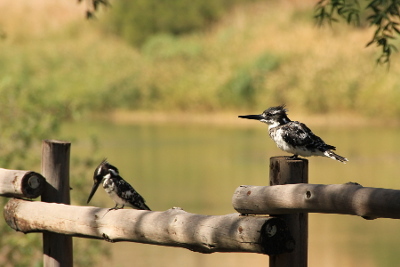 This pair of pied kingfishers were often around. On our way to Ai-Ais we discovered that the back nearside wheel was hot. After some investigation Kevin decided that the handbrake was binding so ended up disengaging the handbrake. A couple of days later we had exactly the same problem with the offside back wheel and he had to disengage that brake as well. 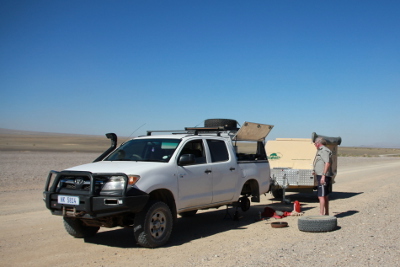 Then a few days later on his morning vehicle inspection before leaving camp (checking the oil, water etc) he noticed a bulge on the nearside back wheel which must have been caused by the heat from the brake binding so we went to a garage and got them to replace the tyre with our spare one that we were carrying on the bakkie roof. We spent the whole 2 months in Namibia without a handbrake but it wasn't a problem at all. 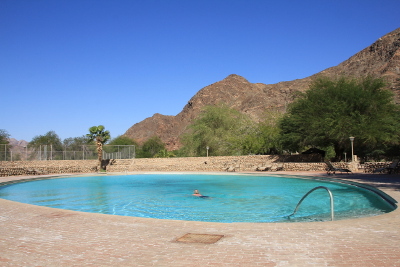 It's seems surprising to find hot springs in the middle of a mountainous desert but that exactly what you find at Ai-Ais Resort. 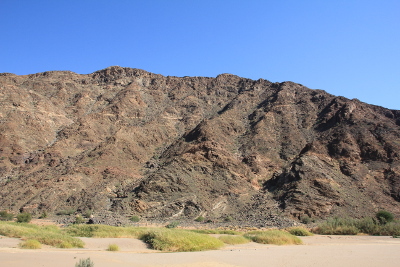 which is on the banks of the Fish River. 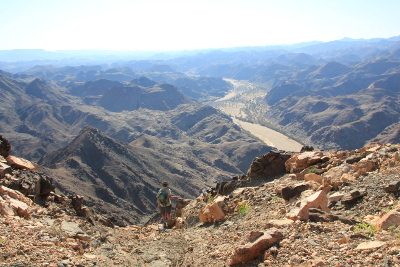 There was so little water in the river that the 5 day walk from the Fish River Canyon to Ai-Ais had been cancelled. We talked to one group who'd booked to do the walk at the same time last year but it had been cancelled then because there was too much water in the river. Ai-Ais Resort in the valley next to the Fish River. The outside hot pool was a lovely temperature for relaxing in on a winter's day. 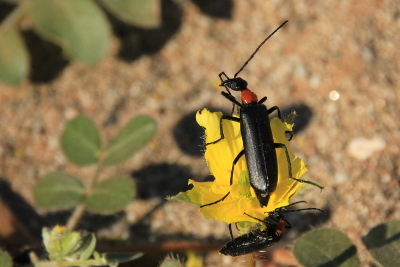 We walked up the sandy river bed one morning and saw thousands of little bugs chomping away on these yellow flowers. The mountain across the river from the campsite which has a footpath to the top. We walked to the top and then returned along the same path. Kevin on the way down with the dry river valley below us. We'd visited the Fish RIver Canyon on our last trip to the area 3 years ago but it was still just as impressive although sad to see so little water in the river. The entrance fee is N$30 for Namibians, N$60 for SADAC residents and N$80 for others plus N$10 per vehicle. We visited all the lookout points along the top of the Canyon. 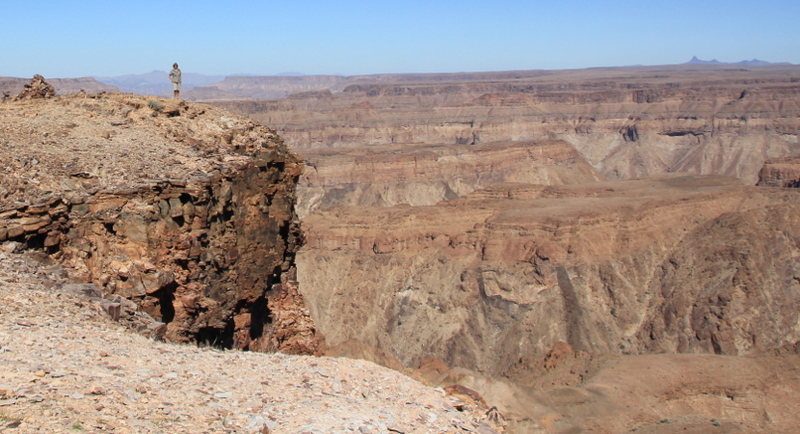 It's very difficult to show the scale of the Canyon with photographs. 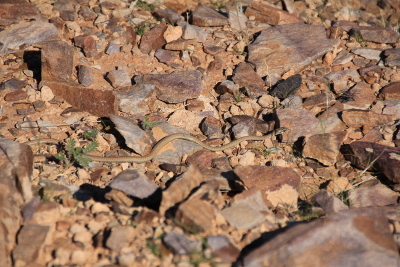 A small snake that we spotted near one of the lookout points. It was pencil thin and about 40cm long.